Native Americans used fire to renew wildlife habitats and attract the animals they hunted. Today, trained specialists can set fires that knock back older vegetation, increase soil fertility, and spur the dense regrowth of trees, shrubs, and other plants. Controlled burning (sometimes called “prescribed burning”) may not be an option for a small private landowner, but those who manage state properties, land trust parcels, and nature preserves can organize and carry out controlled burns to refresh areas of young forest. Trained crews use firebreaks, fire engines, and up-to-the-minute weather forecasts to keep fires under control. Periodic small fires reduce the amount of flammable fuel on the ground, making it less likely that a big wildfire will arise in the future to endanger human lives and property. Young forest created through controlled burning attracts birds, mammals, reptiles, and a huge range of insects, including many beneficial butterflies, moths, and native pollinators. Bats feed on flying insects; birds such as prairie warblers, towhees, and bobwhite quail quickly home in on new plant growth for feeding, nesting, and rearing young. New England cottontails, Appalachian cottontails, and snowshoe hares use young forest refreshed through controlled burning. Shrubs and trees that grow vigorously in the wake of a fire include blueberry, blackberry, pitch pine, fire cherry, black cherry, and many oaks, especially low, dense-growing scrub oak. The timing of a burn is important. Burning in early spring, or when plants have become dormant in fall, will help maintain the current vegetation on a site by top-killing young trees and older shrubs, which allows them to resprout. Anyone planning a controlled burn should contact their state forestry agency to learn about applicable laws and regulations, liability issues, and permit requirements. For more information, see Using Prescribed Fire to Manage Habitats in the Northeast in Managing Grasslands, Shrublands and Young Forest Habitats for Wildlife. To plan and carry out a controlled burn, consult with a wildlife biologist or natural resource professional. These contacts can provide help. 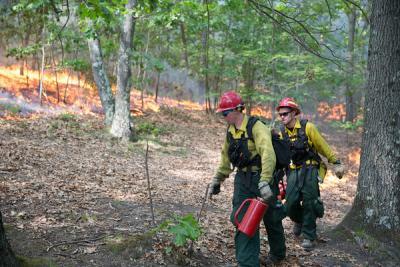 The USDA Natural Resources Conservation Service, or NRCS, offers advice and funding to landowners who want to make young forest for wildlife using various management techniques, including prescribed burning. A wide range of conservation partners have created habitat demonstration areas where people can go see young forest and view the wildlife that these areas readily attract.